Is it hang gliding for baits, kite-sailing for greenies? 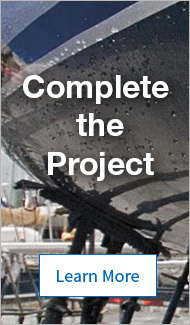 Nope, it’s kite fishing, and it’s a great way to deploy live baits for tuna, marlin, sailfish and other predator game fish. Invented in China, long practiced in New Guinea and other Pacific Islands, modern kite fishing originated in New Zealand, allowing off-the-beach surf anglers to deploy lines and hooks out past the breakers. 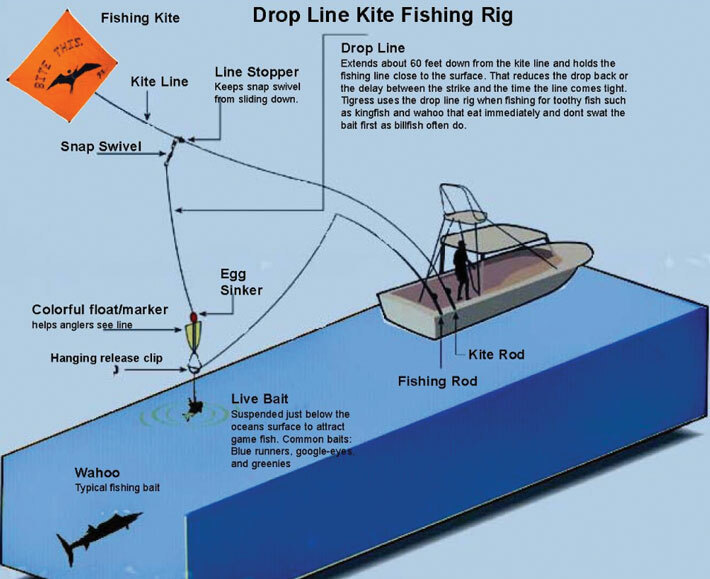 Bob Lewis adapted kite fishing in the bill fish grounds of South Florida, and figured out the advantages of using a kite—keeping the wiggly live bait swimming attractively just below the surface with the heavier leader line hanging vertically above the bait and out of the water, less likely to spook crafty predators. Fishing a kite on the boat’s windward side allows a bigger spread of lines to be presented, covering a wider expanse of ocean. 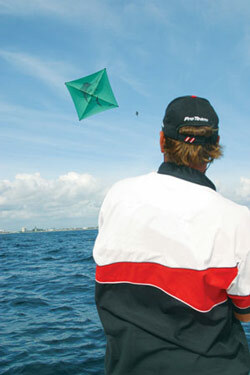 Kite fishing from a boat in steady 10 to 15 knot winds, either drifting or trolling, allows experts to fly two kites with as many as three baits dangling below each kite. A special square kite, with carbon-graphite spars and rip-stop nylon fabric, is attached to a 50, 80 or 100lb. Spectra or Dacron line connected to a stubby rod and powerful reel. There are high-wind or low-wind (5-25mph) models for different weather conditions. Carry an assortment of kites, as well as spares, because you will need another if the kite line breaks and you sink your kite and lose it forever. Also, pulling a kite that’s ten feet under water back to your boat is a big challenge, so some captains attach a small party balloon to the back side of their kite to keep it afloat to save precious minutes while retrieving it during a tournament. Helium balloons are used in light wind to help support the kite. 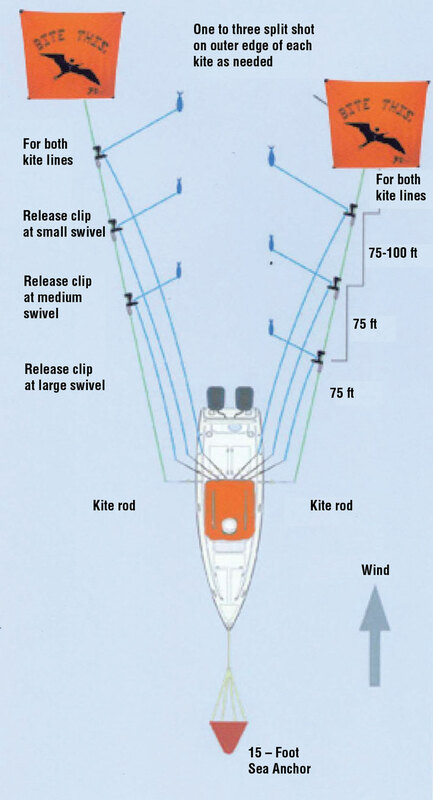 Each kite’s line has one or more release clips, like those used on outriggers, strung at intervals along the kite line, and each clip is assigned to a rod and reel. Experienced anglers fish three live baits off one kite, with the line from each reel clipped onto the main kite line. As the diagrams show, the setup is more organized than you might expect. Mono-filament or fluorocarbon leaders are attached to a fishing reel’s main line with a neon-colored Styrofoam marker about the diameter of your forefinger, with a snap swivel. These markers hover in the air above each of your baits and indicate their location. A dual or three-way rod holder on the transom (such as the Tigress dual or our Trident models shown above) holds your kite rod and one or two additional rods. Kites can also be used from shore anywhere you have the wind at your back, allowing the boat-less angler with a little creativity to present baits at vast distances beyond the realm of normal casting. With the right gear, kite fishing is easier than it looks. A high speed conventional reel like the Penn Senator 113H is great for your kite reel, or a level-wind reel like the Penn 345GT, which keeps the line from bunching up since it comes in fast. Shimano Tiagra 16, TLD15, TLD20 or TLD25 and the Daiwa Saltist two-speed reels are also popular. Power assist electric reels are recommended for even greater convenience, but at a substantially higher price. We stock a range of Daiwa 12V electric reels that connect to a deep cycle battery with alligator clips, plug into a waterproof receptacle, or use a Lithium battery pack. Kite rods are short and heavy, with one ring guide at the tip, about 3' in length, and do just one job: holding the kite line. Your other rods hold your baits. 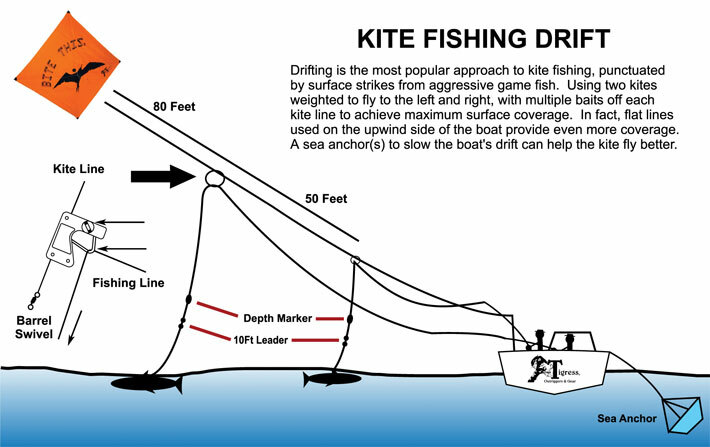 It is often easiest to kite fish with your beam to the direction of drift, and drifting as slowly as possible. The Paratech line of sea anchors are top quality devices to help do this, attached to a midships cleat.